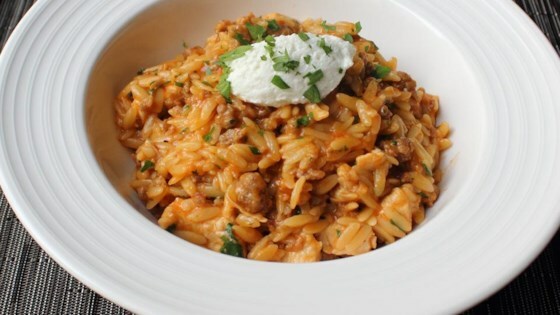 "There's something extra satisfying about a recipe like this one-pot chicken and sausage orzo dish where you just basically dump the ingredients in a pot and wait until it's cooked. Sure, you have to stir it a few times, and it helps if you add stuff in the right order. But for how delicious this comes out, you're doing very little actual work." Place a pot over medium-high heat; add oil. Brown crumbled sausage, breaking up pieces as they cook. Cook and stir until sausage is nicely browned, about 5 minutes. Add chicken pieces. Cook and stir until chicken begins to turn opaque, about 1 minute. Add salt. Stir in chicken broth and tomato sauce. Raise heat to high and bring mixture to a simmer. Stir in orzo and a pinch of salt. Reduce heat to medium until pasta is almost tender and most of the liquid is absorbed, 10 to 12 minutes, stirring occasionally to prevent it from sticking to the bottom of the pot. Remove from heat. Add grated cheese, parsley, and chives. Serve topped with a dollop of ricotta cheese. This one-pot wonder is a quick weeknight dinner full of spicy-savory goodness! The size of the orzo "grain" can really vary, so be sure to check for doneness early and stop when it's 95% tender. It will continue to soften as you complete the final steps. You can sub two boneless skinless chicken breasts for the chicken thighs. Good idea in theory; just way too salty as written. I think we will try again, but will use low-sodium chicken broth and leave out the salt.